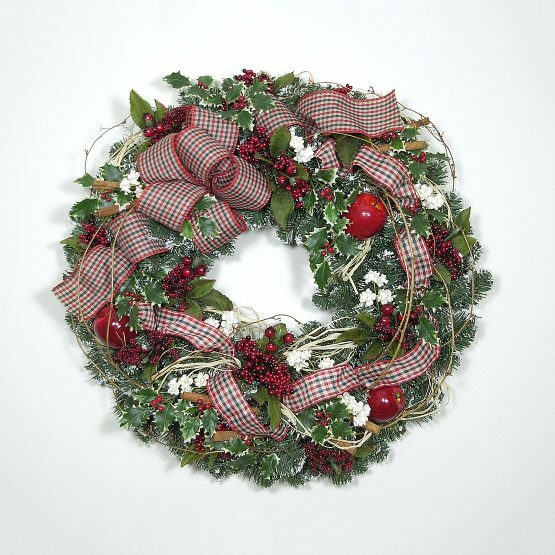 Capturing the very essence of the season, this 22″ white-tipped spruce and fir wreath is loaded with fragrant cinnamon sticks, natural pinecones, red cinnamon apples, holly and winter berries. 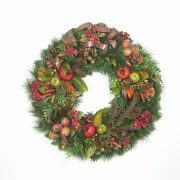 A red and green checked ribbon and bow, along with branches of grapevines and curly raffia, are woven throughout. 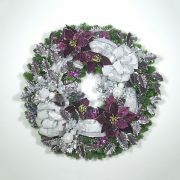 Antique-white Baby’s Breath interspersed adds the perfect complement to the natural look and feel of this wreath.